The nations most visited park surrounds the Poas Volcano. The park covers 25 square miles. 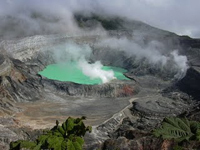 Volcan Poas is 8,850 feet, and scientists estimate it was formed a million years ago. Activity in the volcano seems to occur in 40-year cycles. The drive up to Poas is beautiful. The scenery is pastoral and the views are dramatic. The rim of the volcano is a ten minute walk from the parking lot. A platform is available for viewing the crater in complete safety. However, like other volcanoes, the earlier you can get there, the less chance you have of late morning and afternoon clouds spoiling the view. At 8,000 feet you are already up in the clouds. This volcano is located with very easy access just outside of the Central Valley only a 35 minute drive from the town of Alajuela and one hour from the capital city of San Jose. The Poas volcano has the Barva, Irazu, and Turrialba running southeast down the center of the country one right after another. The area around the Poas volcano is a beautiful area and great spot just to hang out for the day. We happen to have one of our favorite restaurants in all of Costa Rica which is called Freddy Fresas which is located just 7 km down from the crater and has some of the best strawberry drinks. This is also an area that has been a victim of the Cinchona earthquake in 2009 and is good to see tourism picking back up in the area as of 2011. The road that runs around the backside of the Poas volcano is now officially opened and with what our company now calls "Waterfall-Alley". After the earthquake you can now see some very big waterfalls very clearly now.